No Zach Merrett, No Tom Mitchell, No Adam Treloar and Rocky only scored 95 on his comeback. Good thing Calvin will save the day! Over the bye rounds, I will be running my traditional top 10. These are the players, in the order that I would be picking them this week. Obviously I have researched more than 10, but of the best I have found, these are my picks… and as I said, in the order that I would use when picking my captain. But first, we have another partial lock-out this week with the Thursday game between West Coast and Geelong from Domain Stadium in WA, so let’s take a look at that one first. 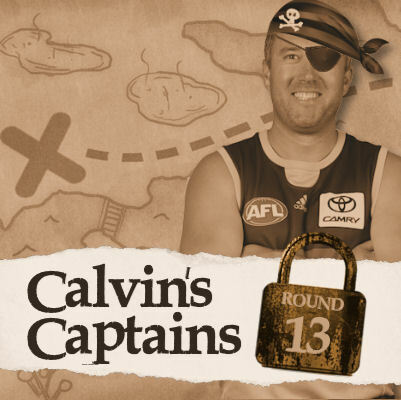 With Rocky’s ‘sore’ shoulder and a score of just 95, along with Zach Merrett and Tom Mitchell having their bye… we seriously need a savour on Thursday night who we can lock in as our Fantasy captain. Straight away, Patrick Dangerfield springs to mind and his numbers against the Eagles are solid as he had 113 on them last year. He loves playing over in the west where he has scored 118, 130 and 142 in his most recent games there at Domain Stadium. Last year, after his bye, he came out and had 139 and I tell you something for free… I’ll be taking that every single day of the week. Joel Selwood has scored 117 and 122 in his last couple of games and had 103 when he met the Eagles in 2016. His brother Scott Selwood (Scooter) has over shadowed him since coming back with scores of 125, 119 and 119. He’s a serious option worth considering with all those scores which are very much captain worthy this week. Mitch Duncan can go big on his day and had 106 last year and like Danger, has great numbers at Domain with 128, 110 and 122. As for the Eagles, my mate Elliott Yeo has scored 106 and 118 in his last two and in typical Yeo-Yeo form, he had 38 on the Cats last year. Credit where credit is due though cause he has averaged 120 (5gms) at Domain this year with a lowest score of only 103. Then we have Luke Shuey, but he’s a pass for me. He had 65 on the Cats last year and only 1×100+ score in his last six against them. He has been good this year, but I’d be looking at someone else in this one. MY VC TOP FIVE – Dangerfield, Duncan, Yeo, Scott Selwood and then his brother Joel. LOOP HOLE EXPLAINED: This one kicks off at 8:10pm and at this time, all your players from the Eagles and Cats are locked into you teams. To use the captains loop hole, place the VC on a player in this game (Dangerfield). If you like his score (line to be announced later), place a non-playing player on the field from the games coming up. Also make sure you have an emergency selected in the same line. The non-playing player will score a 0, and your VC score will double and your emergency will replace the 0. If you don’t like the VC score, select a captain as you normal would. WHAT’S THE LINE THIS WEEK? Always one of the biggest question, and not one I want to answer today, but I’ll be announcing my line for this… after the game, when I go LIVE on DT Talk’s Facebook account on Friday night at 5:30pm. This will give me extra time to calculate all the info prior to lock-out. The confidence I have this week in my top 5/10 isn’t great. Last week, although I had Rocky #1 with 95, my top 5 still averaged 140! Hence my line for last week was 130. I was oozing with swagger before lock-out, but this week… I’m not overly sure. Stay tuned and make sure you join me on Friday night, at 5:30pm LIVE on Facebook. Ok… let get rolling with my top 10. With numbers like a premium midfielder, Big Special K must be talked up this week. 149, 132 and 119 are his last few games and although he only had 70 against Witts earlier this year, his form is too hot. Against the Lions at home, this should be right up Ebert’s alley. He scored 96 against them earlier this year, but is coming off scores of 115 and 142. Surely this means he’ll give them a pasting on Saturday afternoon. JPK has great numbers here and even posted 131 on the Tigers last year. His form has been great without being huge, with scores of 112, 112, 105 and 122. Only managed 76 and 85 in his last two games on the Power, but his form has been unbelievable with scores of 131, 124, 119 and 125. Tough game this week though but I honestly think he’ll get the job done again. Sam Jacobs had a game high 117 last week against the Saints so surely, Goldy will be great too. He has scored 97, 113, 92, 130 and 117 in his last five against them and will be great again. Want to write off the pig? Find another site then cause I won’t be. Firstly, there’s a couple of things here you need to understand. Yep, that 95 wasn’t great and although I missed the game, sources tell me he didn’t look like he usually does. So how will a pig bounce back? This should have you worried of you’re a non-owner. He loves playing in Adelaide where in his recent games he has scored 127, 33 (inj), 140 and 133. Last week, Essendon had six players score over 113 with their three best ball-winners in Zach (151), Heppell (128) and Watson (115) leading the way. What I don’t like here is Rocky’s history against Port who are his worst team to score against in his career. His 95 last week was his lowest score for the year. His next worst was against the Power (at the GABBA) where he had 100 earlier this year. Prior to that he has scored 76, 33 (inj) and 90. Call me silly, but I’ve been called worse. I’m backing him in here at #5. Rocky hates playing the Power, but Beams loves it with previous scores of 68… 106, 123, 136 and 125. Yeah a little blemish there in round 6 this year, but I forgive and forget with other scores like that. Plus the fact Beams has been in ripping form scoring 145, 116 and 144. Top pick if you have traded him back in. If Docherty was a midfielder, we’d be going nuts over his numbers but as a defender, it’s even more amazing. Over the last four games he has scored 149, 130, 119 and 127. His lowest score for the year in just 90 and earlier in the year when he played the Suns (at Etihad) he had 132. In all honesty, as a proud owner… he will be my captain (don’t have the other two in front) if all fails on Thursday night. GWS scored 4×100+ scores on the Blues last week with Whitfield 125 and Shiels 122 leading the way. Carlton haven’t been tagging with Curnow in recent weeks, but surprisingly they did when they played the Suns in round 4 and on that day they sent Curnow to Aaron Hall (98). Soft tag that day, so surely Gaz will be in their sights after his recent efforts of 153 last week. Last time he played them, in round 4, he scored 118 and is currently carrying a lowest score on 108 since round 2 this year. If they want to tag him, I wish them all the best… he’s untaggable which is probably why they went to Hall instead. This man is a monster. The Swans can occasionally bleed a few points and after seeing these numbers, this is the #1, clear cut guy, I would be making captain of my team if Thursday night doesn’t go to plan. He could be anything from 120-160 here and with a Brownlow insights, Dusty has been unbelievable this year, and he continues to add zeroes onto the end of his value for other clubs who want to services in 2018. Just a heads up, Periscope tonight will be at 9pm. Just one hour later than normal as I have double booked with thing I do in my real life. Apologises, but I’ll see you then… with a bloody winner this week too. I think we should call him “The Dochtor” but yeah, he’s my pick too. Too much of a risk for me if archie is named, even though he did drop a 120 last week. Great work as always Legend! Now that I have sucked up a bit, I’m going to be ‘one of those’ people. Sure to most of us it’s common sense, but I feel like for the beginners it needs to be clarified. I think you need to change “place a non-playing player on the field from the games coming up. Also make sure you have an emergency selected in the same line.” The beginners might need a bit of clarification that they need to put the ‘c’ on the non playing player. Remember, u have them for the rest of the season, not just this round. Dusty is known to have an off game every few weeks and Gaz is a consistent as they get (if you ignore his tendency to get injured). I say stick with your original decision and go the GOAT. Stick with your plan. For ages I planned my trades so I could finally afford Doch after his bye. Threw it all out the window to get Rocky and it cost me Doch’s huge score plus Titch as captain. And now Doch is too expensive. And when you change because of someones opinion you always come unstuck. They are both great options but stick with your original trade and work for Dusty ASAP. No Jeppa’s Juniors this week?? Oh dear…never a good sign when you only have 1 of Calvin’s top ten!!! Thanks again for the article Cal, gives me a lot to consider…. C’mon Danger pump a 135 and make the choice easy!! Gaff an option for vc? What’s his history like against Geelong? 90, 113 and 104 in his last 3. How can you have Goldstein in the top 6?? has gone over 100 twice this year…. Did you even read the stats he has against the Saints mate? He avgs 110 against them. Yeah, I question whether opposition history is ever relevant. Gary v Hawthorn and things like that might be an exception, but I would love to see some stats to prove something one way or another. So many times I can remember backing in guys with massive 3 or 5 round averages against the upcoming opposition, and more often than not they don’t turn out well. In this case, Saints recently gave up scores to a very similar style ruckman (sole ruck, mobile, etc) and there is no reason Goldstein wouldn’t replicate that. Bearing in mind that Calvin releases a top 10 during the byes, and with no Mitchell, Merrett, Treloar, Grundy, Kelly etc, and the line for a decent captain score probably 110-120, there will always be a few smokies among the 10.
opposition history can be very important. if scooter is playing against crows again this year and sloane is playing I know I will not pick sloane as a captain. 6:25 tomorrow teams will be announced. That’s when we all find out if any new rookie will play. Where’s the guy who said that Charlie Dixon should be in Calvin’s captains? He’s working at channel seven on the breakfast show. Hi folks, word of warning for the Thursday night games. If you want to trade in or out a Thursday player, if you can, make that trade first so you can reverse the other two before full lockout. For example, I’m doing Roughy,Myers, McCarthy out and SCOOTER, Hibberd, Heeney. Lots of ways to do this with the Newnes dpp move. Doing Roughy to Scooter first (need $44k in bank) I’ve still got Friday to change the other two if there is a selection surprise while I am out for dinner tonight. I got caught out three weeks ago with a non playing Luke Ryan. Is it worth trading out Fyfe for Scooter Selwood. Im doing DT so trades are like gold, but would it be worth doing the swap? Will Fyfe come good at the end of the year or can you see them averaging something very similar? Same price, but Scooter has a higher average (+29), lower BE (Only 31) and is playing this week. Barring a massive turnaround, Fyfe is going to stay at about a 90 average and the same price for the rest of the year. Meanwhile Selwood is projected to increase $64,686 over the next 3 weeks providing he averages about 100 over those 3, making him a nice stepping stone to a premo. Sorry – dumb question – does RDT have a loophole? Wondering whether to drop Steele and bring in either Dusty, Hanners, Kennedy or Beams (had him previously and feel I would be going backwards here).